Behaviorism is a branch of psychology that only focuses on objectively observable actions in order to explain human behavior. It only examines outward behavior when trying to determine if learning occurred and discounts any independent mental processing like thinking or emotion. Behaviorists define learning as nothing more than the acquisition of new behavior based on environmental conditions. They believe all behaviors are learned through interaction with the environment. They advocate that learning actually occurs when new behaviors or changes in behaviors are acquired through associations between stimuli and responses. Behaviorism was founded by John B. Watson in 1913 when he wrote an article entitled “Psychology as the Behaviorist Views It.” The article expressed the viewpoint that psychology was an objective science and that internal mental processes should not be considered because they could not be directly observed and measured. Behaviorism was the dominant learning theory in the first half of the twentieth century, however, it is no longer widely cited by many academics. However, the theory of behaviorism has laid the groundwork for understanding how people learn, and has had an influence many behavior focused roles and occupations such as teaching, parenting, coaching, mentoring, and training. Behaviorists believe that humans learn behaviors through conditioning, which associates a stimulus in the environment. Because behaviorism focuses on observable behavioral outputs, behaviorists believe that any task or behavior can be modified with the right conditioning, regardless of a person’s genetic traits or thinking patterns. Conditioning may be neutral or may include consequences such as rewards or punishments. Classical conditioning is a learning process in which an individual learns to associate an unconditioned stimulus that already brings about a particular response with a new conditioned stimulus, so that the new stimulus brings about the same response. Classical conditioning is associated with psychologist Ivan Pavlov and his experiment with dogs. In his experiment, Pavlov conditioned dogs by pairing food and a bell to create a conditioned response of salivating. The learning process involves pairing a neutral stimulus with an unconditioned naturally occurring stimulus that already elicits a desired response. It is referred to as a neutral stimulus because it is not yet associated with the response. However, by continuously paring the two together, they become closely associated. 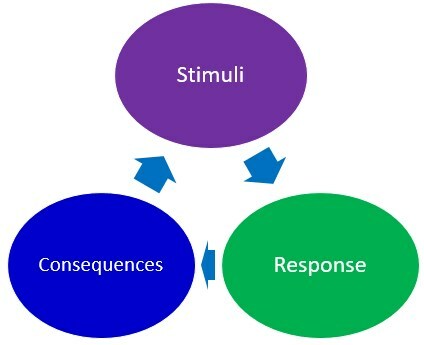 The naturally occurring stimuli, with which the neutral stimulus is paired, produces automatic or reflexive responses, and not voluntary behaviors. These unconditioned responses occur with no conscious awareness. Examples of automatic responses would be salivation, nausea, increased heart rate, or pupil dilation. After several pairings, the two stimuli become unconsciously linked. They become so closely linked that eventually the neutral stimulus comes to evoke the same response as the naturally occurring stimulus, even without the presence of the naturally occurring stimulus. In Pavlov’s classic experiment, the neutral stimuli was the sound of a bell and the unconditioned stimulus was the food which naturally produced an unconditioned response of salivating. By associating the neutral stimulus (bell) with the unconditioned stimulus (food), eventually, the sound of the bell alone could produce the salivation response. Operant conditioning is a learning process in which responses are controlled by their consequences. It is basically a simple feedback system were learning occurs through rewards and punishments for behavior. Through operant conditioning, an individual makes an association between a particular action or behavior and the resulting consequence. If a reward or positive result follows a certain action, the behavior becomes more likely to occur again in the future. On the contrary, behaviors followed by punishments or adverse outcomes become less likely to happen again in the future. Basically, a person learns how to act based on the consequences of their actions. The likelihood of a certain response occurring is either increased or decreased due to either a reinforcement or a punishment consequence. A reward or reinforcement helps to increase a behavior, while a punishment helps to decrease a behavior.